Continuing the oceanic theme of wine brands produced by Stonefish International, the Black Pearl label was introduced in 2012 to satisfy increasing demand for an entry level range of Australian wine. In 2015, work began on a rebrand of the Black Pearl packaging, with the new-look wine label due for release in early 2016. 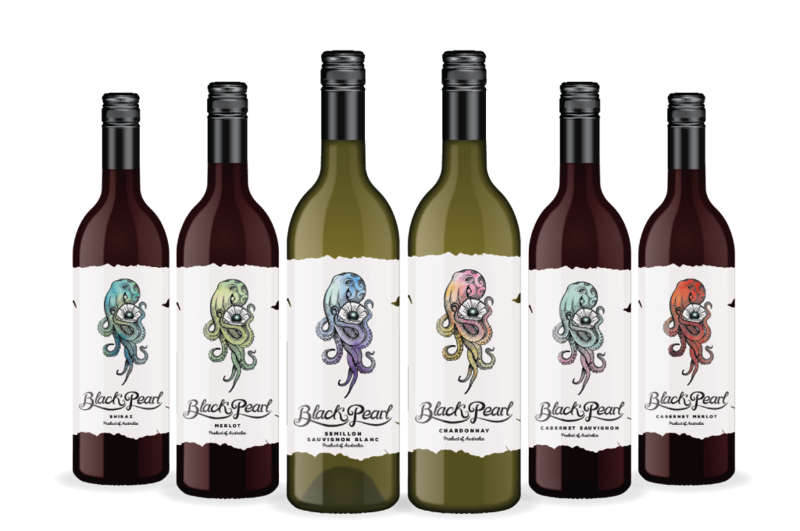 The new branding of the Black Pearl wine range calls to a whimsical underwater world of giant sea creatures, showing a giant squid protectively exhibiting her favourite treasure, a rare Tahitian pearl. The artistic label combines the illustrative work of Sunshine Coast artist, Kathryn Berg with custom calligraphy by Graphic Designer, Sarah Hill. The wines are sourced from carefully selected vineyards across South Eastern Australia, the precise vines chosen for each vintage dependant on both quality and availability. While the range represents the bottom tier of offerings from Stonefish International, there are no compromises on quality or consistency of supply. Crisp, clean palate with tropical and citrus fruit flavours with a refreshing finish. Pleasant flavours of apricot and melon with subtle oak integration; suited to white meat dishes, seafood or salad. Bright plum and dark berry flavours complemented by subtle oak on the palate; a perfect warming wine. Fragrant bouquet complemented by a soft palate with intense pepper, plum and spice flavours. Lifted fruit characters of red berries and blackcurrant with lingering flavours that complement a range of cuisines. Black Pearl wines are available in Australia through Estate Wine Distributors or can be bought online through Red White & Bubbles.